Erza’s trial turns out to be just a front, to make it look like the magic council has the situation under control. Despite Natsu’s interference she is let off. In the meanwhile, Natsu and Happy rope Lucy into going on an S-Class mission, something that could get them kicked out of the guild. They travel to the cursed island of Galuna, where they find a demon frozen in eternal ice, and a cult trying to free him, led by a familiar face from Gray’s past. All the while Erza is traveling to the island to bring the truants back home. It’s been a while since I’ve read the begining of Fairy Tail, and rereading it for these reviews has reminded me why I love it so much. There comes a point where a series becomes stagnant, or the story slows down when read on a weekly basis. Coming back to the begining has helped me put into perspective why I consider Fairy Tail to be one of my favorite shonen series of all time. The important thing, in my opinion, in shonen manga is that sense of adventure. You read it to put yourself in the position of the main characters, and know for a little while at least what it feels like to be a badas. Fairy Tail takes that feeling, and adds a sense of adventure. The focus on going out on jobs in this volume, along with the introduction of the S-Class jobs helps emphasize the idea of adventure for the sake of fun and profit. I think Fairy Tail is at its strongest when it follows this format. I don’t need an ongoing story for a series like this. All I need is for the characters to go back to the guild, before going out on their newest adventure. Later volumes lose this sense of adventure in favor of plot. But for now we’re in what I consider the golden age of Fairy Tail, when adventure was everything. The Galuna Island arc is entirely Gray’s story. Even though Natus and Lucy are the instigators of this plot, ultimately the story is about Gray’s connection to Lyon, and their past with their teacher. We don’t go into detail about what that past invovles just yet, but enough groundwork is laid to wet our appetites for the plot to come. 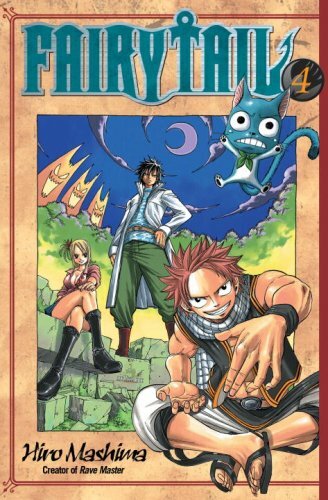 The last few chapters of this volume are the strongest, with Gray’s initial fight against Lyon setting the stage for the central conflict and drama of this story. The difference in their fighting styles is tied together thematically, and well rendered on the page. In this volume we start to get character info cards, these are a welcome addition and useful for looking up basic information about the main and side characters. Natsu’s lack of an age on his card is interesting, and still hasn’t been answered even several years later. If I have one complaint, and it’s a complaint I have to make about a lot of manga, it’s that Mashima is one of those manga-ka that doesn’t understand how a running gag works. At most it should be brought up three times, maybe a bit more. But Mashima, and Shimabukuro is guilty of this too, seems to think that the more a gag is brought up, the funnier it is. The problem is that even if the joke is funny the first time, and often it isn’t, it will lose all its bite after the eight time. In case you hadn’t noticed, I’m not a fan of either Sherry or Toby. I love humor, but that does not extend to a tolerance of “quirky” characters. This is the start of the first really long arc, that covers more than a volume or two. This is the essentially the point where new readers to the series will find out if they want to keep reading. If you enjoy what’s to come, then you’ll enjoy what follows after the end of this arc.